WEST COLUMBIA, SC (WIS) - Alex Bowen said he couldn't sleep. So in a hungry and slightly drunken stupor, Bowen said he walked to a West Columbia Waffle House early Thursday morning and found it empty of other customers. He also didn't see an employee right away. With hunger calling out to him and no bacon sizzling on the well-worn Waffle House grill, Bowen said he waited for 10 minutes at the register. "I walked back outside to look for employees," Bowen said. "No one in sight." Bowen said he didn't notice the sleeping employee in a corner booth at first, but he walked back inside. "Walked back in and waited a few more minutes and then it was go time," Bowen said with a laugh. 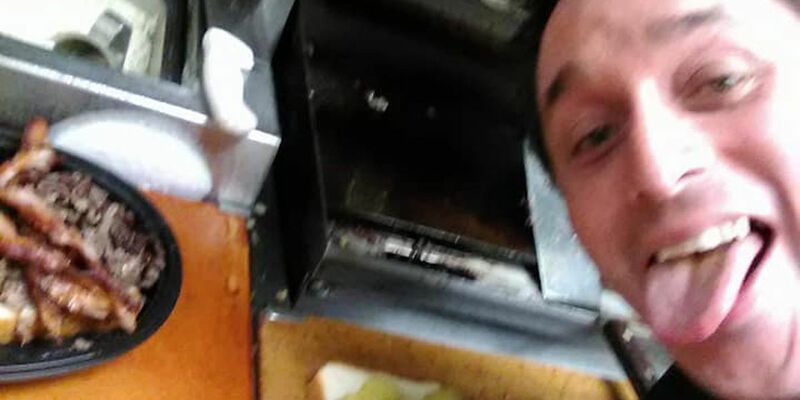 In a post on Facebook, Bowen showed the sleeping employee how he became the king of his very own Waffle House. "Got hot on the grill with a double Texas bacon cheesesteak melt with extra pickles," Bowen said. "When I was done I cleaned the grill, collected my ill-gotten sandwich and rolled on out." The photos in this post show Bowen in the cooking areas and a stacked sandwich. "I give all the credit to my old friend vodka," Bowen said. "I wouldn't normally have done that." In his honest telling of this saga, Bowen said he stopped by the same Waffle House Thursday afternoon to check on the store - to make sure no one was asleep on the job (again). He said one of the employees says the store isn't very happy with his exploits. "Yeah," Bowen said. "[I] guess old waffle house just gonna have to take the L on that one." When asked if he paid for the food before he left, he said no but said he gave the employee $5 when he returned Thursday afternoon. A Waffle House spokesperson said the sleeping employee was suspended for a week. He also said that in speaking with Bowen, there is no slight in his actions and that it points out greater issues that they will address in the future. Our local Division Manager has spoken to Alex and apologized. For safety reasons, our customers should never have to go behind the counter. Rather they should get a quality experience delivered by friendly associates. We are reviewing this incident and will take appropriate disciplinary action.